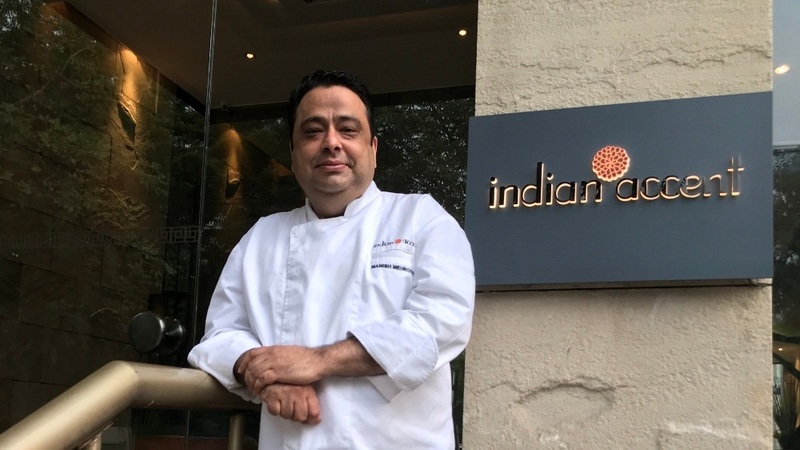 In an interview with Restaurant India, Chef Manish Mehrotra shares secret to menu designing and planning at Indian Accent and the newly-launched Comorin restaurants. Born and brought up in Patna, Bihar, Chef Manish Mehrotra did his hotel management from IHM, Mumbai. He had worked with Taj Group in Mumbai for four and a half years. And, since 18 years, he is associated with Old World Hospitality; started Indian Accent in 2009. All the dishes on the menu are invented in my kitchen. Previously, you would not have found those dishes anywhere else, in any other restaurant. But, now, definitely, you will find because, after 10 years, there are lots of recipes people might have taken from the Indian Accent kitchen. The thing is – all these dishes were invented in the Indian Accent kitchen and that is why we call it inventive Indian cuisines. There are many. To name a few - chilly pork ribs, warm doda burfi treacle tart, daulat ki chat, and more. The modern Indian food can come from a traditional Indian only. The heart and soul of the traditional food should be there in modern Indian dishes. While eating, you should feel that you are eating Indian cuisine rather than seeing it as an alien dish. It should be relatable yet different. The dishes at Indian Accent are inspired by my travels at different places, my childhood, nostalgia and day-to-day life. We recently started a new tasting menu. There are dishes which are quite rooted and the flavours are traditional but done in a different way, whether it’s a black carrot halwa cannoli or kadhai paneer or amuse bouche masala dosa, all these remind you of a traditional flavour but it looks totally different; the combinations are different too. We recently launched Comorin; it’s a totally different concept if compared with Indian Accent. Comorin is a modern-atmosphere bar, and traditionally inventive Indian food items are on the menu. The food is not invented by the chefs but the street vendors and housewives. Things like Cheeni Malai Toast or a Champaran Mutton Curry or a Butter Seekh Kabab, all these food are invented by different people. We have taken all those types of dishes and have put it on the menu. It’s a very hearty comfort Indian food but with a little bit of twist. - Use seasonal food items.When you use seasonal foods it becomes cost-effective. It is also a way to maintain a good health practice. When things are in season they cost less. When you use seasonal vegetables, they are fresh and free of pests. Hygienically it is good. You need not clean them that many times. - Your menu engineering should be in such a way that one ingredient can be used in two-three different cuisines. That’s how you can control the food wastage and make it cost-effective. - At casual-dining restaurants, the dishes should be simplified. Too complicated dishes need more inputs and ingredients; it needs a messy work. This can increase the cost. - You have to follow good hygienic kitchen practices when you are working. The kitchen staff is trained about the regular kitchen hygiene. Staff is required to keep things on vegetarian and non-vegetarian things separately, to maintain correct temperatures of the fridge, ensuring the food is not in the danger zone. Uniqueness is very important. If the menu is not unique, it will look the same as that of any other restaurant. The uniqueness comes from the innovations from the chef’s knowledge. Why Daily Diners Must Make Informed Choices..
How Do I Start My Own Preschool.. Ethnic Food is the New Turn: Ranveer Brar..